Contains a few thoughts on people, life and other random things. 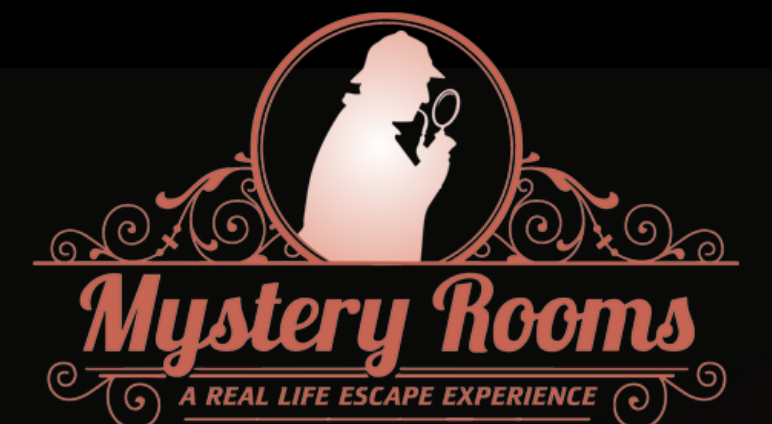 Mystery rooms and escape games are what this post is going to be about. I have been addicted to it and have finished almost all the rooms in Bangalore. After tearing my ligament twice in 4 months, I had to give Sugar a break. I took buses and trains to go around during the long weekends, but mostly I've been throwing my money at the Escape Games here. In fact, there was even one in Coimbatore, where we won a tiny gold coin, for escaping the prison in 34 minutes without any clues. I've been playing games on my phone, like Doors, almost 3-4 years back but now these escape rooms have become a real (and a popular) thing. 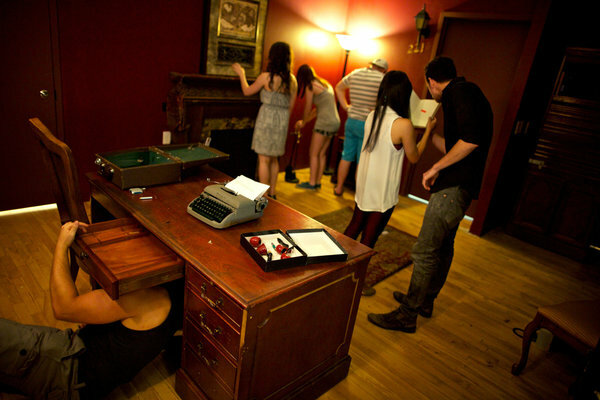 Mystery and Escape Rooms are game places that require you to escape a game in 45-60 minutes. 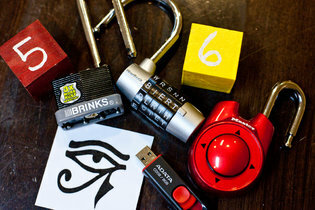 In every game, you will have to solve puzzles to open a few locks and go through a set of doors and even lasers to get out. In the end, you will be escaping a prison, solving a murder mystery or even detonating a bomb. You will have a 'game master' monitoring you and will help you in case you are stuck or doing something wrong in the game. You get to be the Mentalist and the Sherlock! This is usually a group activity, but I've been checking (almost all of) them off with just one other like mind. They do allow 2 people to take on a game of 3-4 people (under a few conditions though). I'm not very smart to have won all of them, but I've won a few and have been having fun doing it. And I'm writing this for y'all to have some fun. Not all the providers are the same, they have different games, some might have the same name and theme, but they're still different. They almost use the same rules though- No physical force required to look for clues, nothing on the ceiling and the fan, press the button (indicated) to call for help/clue, that (indicated) is your timer and the tv screen etc. The games have a difficulty level which you can choose according to who is playing it with you. The 5/5 will be a bit tough for beginners, but you can always start at 3 or 4. It all started here, around May, and I guess they had around 4 games. We went as an office group and tried to finish all of the rooms in one day, this was sometime back and I don't have a great memory. But almost all the rooms were fun but I remember so well, the vampire room probably because it was the most fun for me. This is right across the road to the Escape room game place but seemed a bit more sophisticated and new. All the games here seemed more organized and fun somehow. This place is truly one of the best places to play escape in all of Bangalore. They have good themes and fun ways to ask for clues. They also have a GoT themed room which does not have locks, but other fun things that open doors. After opening a lot of locks you tend to appreciate the lack of locks because it sure must have taken effort! Their only room in Koramangala is best suited for 3 or more people, but we went anyway and came out a minute past the hour. The room felt a little tough as it progressed. It was not very sophisticated but it quenched the thirst of the quest for us. They said they'll have another psycho-themed room in a few months! We're waiting for this one. This is inside the play arena and the rooms here were fun too but nothing very special about them. The plots are simple, the rooms are fun and they keep you occupied. Games that keep people in separate rooms are more fun to me, and the serial-killer themed game was something I'll remember this place by. This place is different from the other game places in one way; You not only have to escape but also come up with the reason as to why and how someone got murdered and what happened to the agent that disappeared. They have 3 rooms and all 3 of them need your reasons once you escape. The rooms are fairly structured and fun; quite a lot of theory though. Now this too is one of the best places to play escape and all the rooms they have are fun to finish. They might seem a bit pricey but after playing their rooms, it might just seem worth it. If you escape before the hour they also honor you with a genius medal. I enjoyed the 'Abduction' room the most, followed by 'The Hurt Locker' and the 'Kon of Kohinoor'. 'Abduction' truly induced panic and was also fun because you are handcuffed separately and in the bomb defusing game- The Hurt Locker, it feels you are really defusing a bomb. We defused it before time but they even showed us what happens if you hadn't defused it. This place is fun I tell you! The waiting room of this place looks pretty elegant and their games too have variety and taste. 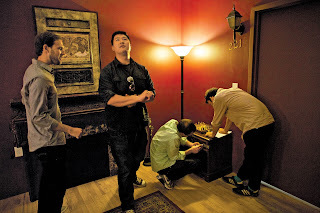 In one of the rooms, you must use more than one of your senses to solve a piece of the puzzle. I think this is the only place to have the most number of games in Bangalore (7-8 game rooms). We haven't done a couple of games (Bank heist & Bomb defusal) here because it needed more than 6 people. The Evil Lucy is one creepy game, and it will give you goosebumps and keep the creepy feeling up for a good amount of time. If it makes you feel any better, the lights will never go ON in here. Bwahahaha! This place was worth it for me, because they have a lot of games and more than just locks they have other things that are fun (like a foam pit!). 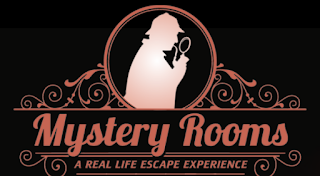 This is a good and humble place that will reward you will a tiny gold coin if you escape in time without clues. I won the coin in Coimbatore (for escaping the prison) and got a coupon and a small printed photo standee in Bangalore for participation (in the Godown abduction). It's a bit special if you're rewarded, isn't it? Except for the Godown game (that required more than 6 people), the other two seemed alright and escape-able. This place has a room for absolute beginners and kids! All the other 4 rooms they have are also fun and quite intense. They have a black and white room that felt a bit hard and lost, but the others games were the usual good fun.